Various industries are tapping virtual reality when trying to innovate within their marketing departments. Though it hasn’t hit the majority of homes just yet, VR is something that can make in-store and event venue displays stand out. Previously we’ve reported on just this type of promo, including Adidas’ VR sport boot launch in London. Various films have even taken advantage of VR promos with experiences like The Martian. 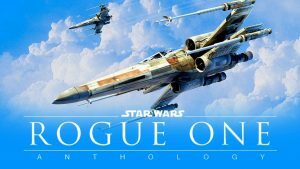 The Star Wars franchise has the benefit of having permeated nearly every facet of entertainment you can imagine, from toys to comics to entire expos, but the powers-that-be aren’t shy about utilizing VR, and Verizon has partnered with Lucasfilm for an experience that’s available in their stores exclusively from November 10th -13th: Rogue One: Recon – A Star Wars 360 experience. If you miss out, it’ll be made available on the Verizon Facebook page on the 14th. Rogue One: Recon, developed by ILMxLAB, is a 360-degree video from the perspective of an X-Wing scout that just happens to come across the infamous Death Star along with another pilot. The two make a jump into dangerous territory and attempt to warn the rebels about what they find. The Rogue One film’s plot gets moving when the Rebels intercept a coded imperial message about a weapons test that ends up being the Death Star, so it seems the two scouts from Recon failed to make contact. Although brief, Recon is a cool way drop fans of Star Wars into the story in anticipation of Rogue One. The first viewing will have focused on the action, but second and third viewings let you appreciate a lot of details including the many instruments within the X-Wing’s cockpit. Rogue One: Recon is a snack sized feature with high production values, a signal that developers are putting their best foot forward with VR. The few minutes fly by and leave you wanting more at their conclusion, which is exactly what it’s supposed to do. Head into a Verizon store until Nov. 25 to see it for yourself.